If I was allowed, I’d be swearing right now. That’s what I’d be saying if I was The Darkness 2, sequel to the cult hit-and-miss comic book shooter of 2007. I’d be a blaze of overhammed fury and four letter words, constantly defying that adage of good writers everywhere – show, don’t tell. At the same time though, I’d have good reason to be so sweary and obvious. If I was The Darkness 2’s Jackie Estacado then I’d have to face down an entire secret organisation of people desperate to steal my demonic powers, while also running a mob syndicate and dealing with the emotional fallout of having my girlfriend murdered in front of me. Even at my most peaceful moments I’d still have to wage constant internal battles against my literal inner demons to stop them taking control of my body and wreaking carnage across the city. 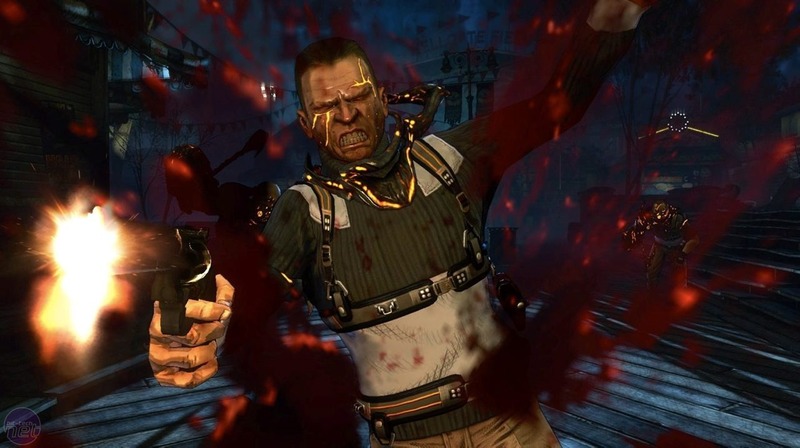 So, yeah – if I was The Darkness 2 then I’d have good reason to be so obviously effin’ angry. On the other hand though, what would I have had to complain about? I’d be the leader of a mob organisation, I’d be living in a palatial uptown mansion and I’d know that if anyone ever crossed me then I could rend them into pieces with the shadowy tentacles that emerge from my back. Eff this? Eff yeah, more like. Either way, whether you think returning protagonist Jackie Estacado is a whiny goth kid or a got-it-made man, developer Digital Extremes makes sure you’ll remember it firstly for all the effing and gore. Everything else in the game alternates crazily, at one point throwing you from a funeral to a graveyard rampage in the space of ten seconds, but the flow of crudity and crimson remains constant throughout. And yet, at the same time, it’s hard to criticise The Darkness 2 for these sudden, radical changes of pace – it may feel schizophrenic, but that’s something true to Jackie’s character and situation. Tired and tortured, it’s part of Jackie’s dark nature to lash out violently whenever he can and to dwell on his broken heart. Gloriously gory gunfights collapse into flashbacks about Jenny, while normally calm loading screens are replaced with bloody stories from the past. The same splitting of opinion occurs when you get down to the central mechanics too. Jackies’ demonic tentacles act like a second pair of hands, complicating an already crowded set of controls by letting you hurl scenery around and lash at enemies in any direction. Layered on top of that are more rarely used demon powers, the option to dual-wield conventional weapons and a light-based vulnerability which essentially doubles the number of targets in any room. Also, you have a British-voiced mini-demon who follows you round, occasionally letting you take control of his body or throwing him around as a weapon. There’s a lot going on. It’s a crowded feature-set to shove into a game and one which often ends up spoiling the otherwise excellent combat which it surrounds. All you have to do is press R or E at the wrong moment and you’ll find yourself not reloading your gun or slashing an enemy, but grabbing a new gun or piece of scenery. It’s only through careful attention and plentiful mistakes that you can reliably overcome these obstacles. 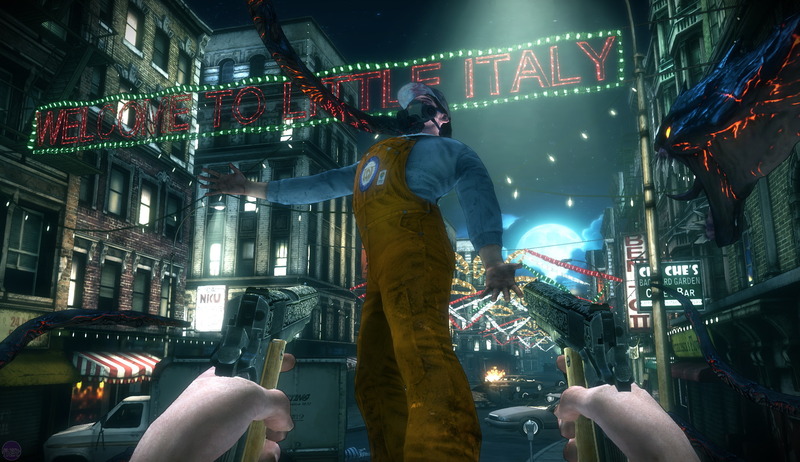 2K Games has delayed The Darkness 2 until next year.